The MX-5 Miata has delivered joyous fun behind the wheel at affordable prices ever since it was introduced back in 1990. The current-generation Miata keeps up the tradition; it maintains the Miata’s pure-sports-car character while offering up-to-date technology features. The interior is cramped for anyone over 6’0” tall, and the tiny trunk means you’ll have to pack light. The Miata has one of the slickest manual convertible soft tops ever; it can be easily raised or lowered by hand in seconds. The MX-5 Miata is Mazda’s zippy, 2-seat-convertible sports car. 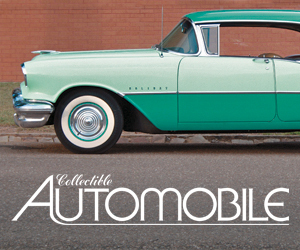 It comes as a traditional soft top and an RF (Retractable Fastback) model with a targa-top body configuration. The RF has fixed rear roof pillars and a power-retractable hardtop center roof panel in place of the regular Miata’s manual soft top. This diminishes the open-air feel somewhat, but allows for a bit more security and styling flair…and the RF has the same trunk capacity as the soft-top Miata. Trim levels on the soft-top model ascend through Sport, Club, and Grand Touring models; the RF model is available only in Club and Grand Touring trim. The lone Miata powertrain is a 2.0-liter 4-cylinder with 181 horsepower and 151 lb-ft of torque, paired with either a 6-speed manual or 6-speed automatic transmission. 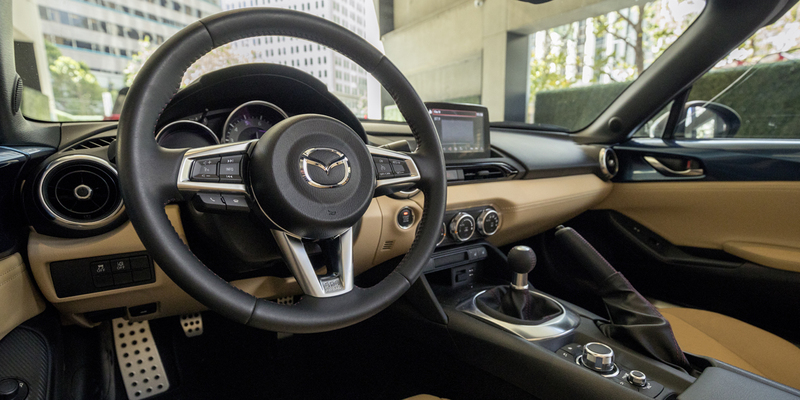 Available features include lane-departure warning, rear cross-traffic alert, blind-spot monitor, automatic high-beam control, Bluetooth connectivity, a navigation system, and the Mazda Connect infotainment system with a 7-inch touchscreen. 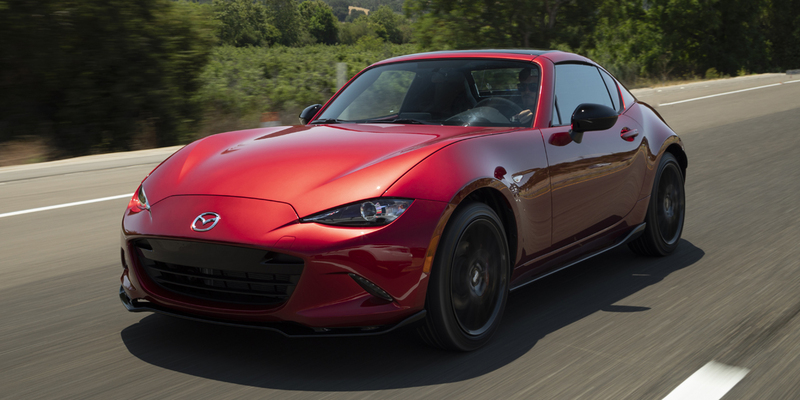 A 17-percent increase in horsepower is the biggest news for the 2019 Miata; output is now 181 hp instead of 155. Other enhancements include a tilt/telescopic steering column in place of the previous tilt-only unit, a standard rearview camera, and the availability of Mazda’s Smart City Brake Support and Traffic Sign Recognition safety technologies. The EPA rates the Miata at 26 mpg city/34 highway with the manual transmission and 26/35 with the automatic. 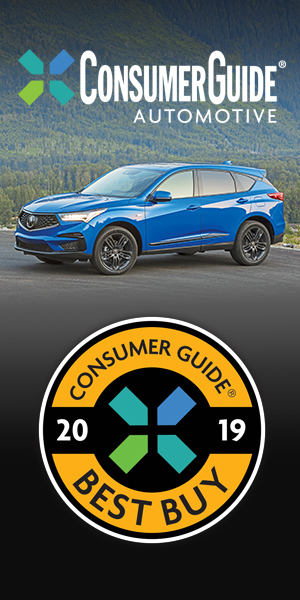 In Consumer Guide® testing, a manual-transmission Grand Touring model averaged 30.7 mpg in 60-percent city driving. Though the current-generation MX-5 Miata offers a level of sophistication and safety/technology features on par with most modern popularly priced cars, it stays true to the simple, lightweight, affordable, and “tossable” design philosophy that has been a Miata trademark since day one. 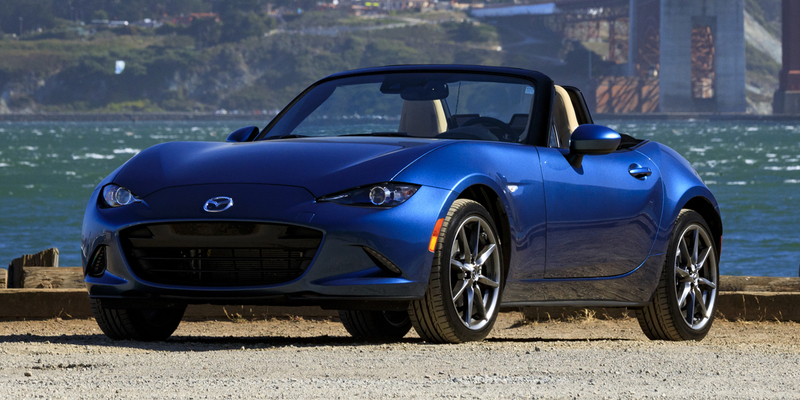 If you’re looking for a sports car with ferocious acceleration, a Miata is not for you. 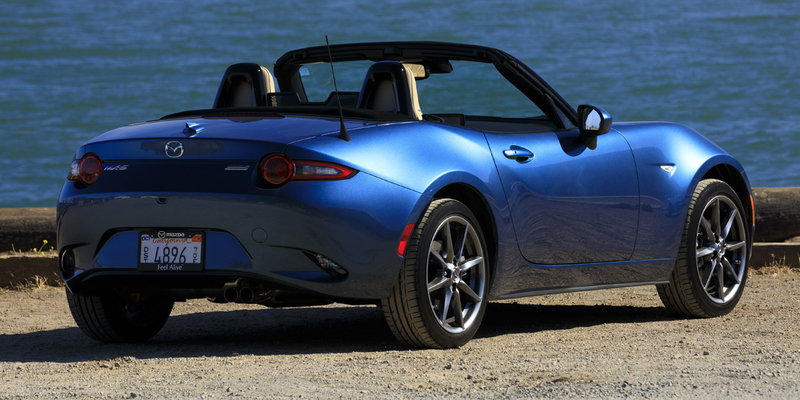 However, if you appreciate an agile, well-balanced roadster that offers driving satisfaction that transcends brute horsepower—at a sticker price that doesn’t break the bank—the Miata is hard to beat. The RF adds hardtop security and versatility in exchange for a bit more weight and a higher sticker price. And, the horsepower infusion for 2019 makes all Miatas even more responsive and fun to drive. AVAILABLE ENGINES 181-HP, 2.0-Liter 4-Cyl.